We are frequently asked the question... "How much does a funeral cost?" In order to provide the answer to this question, Iverson-Kassian Funeral Services has developed this planning guide to provide you with information that may be useful in planning funeral services or comparing our charges with other funeral establishments. SERVICES - Services, facilities, equipment and transportation by the funeral home. MERCHANDISE - Casket, outer burial container, urn, clothing, etc. CASH ADVANCES - Items that are purchased outside the funeral home which may be incidental to a service, such as obituary notices, flowers, clergy & music honoraria, cemetery/interment charges, etc. Funeral homes provide many options today. Services range from immediate disposition services such as immediate cremation or immediate burial with no rites or ceremonies, to complete traditional funerals with visitation and funeral rites. The cost of a funeral service is determined by the level of service which you request the funeral home to provide. Please see the General Price List for itemizaiton of the above services. Services with the body present for reviewal or services that involve burial, usually require that a casket be purchased. A casket is not necessary if immediate cremation is desired. The casket you select can be a major portion of the overall funeral expense. Their cost is derived from the manufacturing of a particular design, material and labor to construct a particular casket. We feel it is important to offer you a wide selection of caskets in an affordable range. We offer 9 caskets priced under $2,000.00. Our casket display room has 13 different caskets and we have photos of other caskets that we can have delievered on short notice, all are clearly marked with the price for your comparison. It has always been our policy to allow the family to make this selection in private. After a brief explanation of the caskets is given by the funeral director, the family can then discuss and select the casket of their choice in private. We respect your privacy and will not follow you around as you discuss a very personal dcision with your family members. Most cemeteries require an outer burial container or vault for burial. This container supports the weight of the earth on a casket so that it is not crushed, therefore, graves won't sink and monuments or grave markers will not tip or settle. Some other burial containers also have a tongue & groove seal for protection purposes, these are know as burial vaults. We have 8 different outer burial containers/vaults to select from, all clearly marked with the price for your comparison. Cash advance items are goods and services that are purchased from sources other than the funeral home. Funeral homes cannot mark up nor increase these charges to you without informing you that they are doing so. For your convenience, we will purchase and/or arrange for these items and pay the individual vendors involved. The following is a list of common cash advance items. In North Dakota, these copies cost $5.00 for the first copy and $2.00 for each additional copy at the same time of ordering. They are purchased from the North Dakota Department of Health, and are needed for life insurance, title transfers and other financial transactions. The cost of purchasing a grave varies among cemeteries. Graves may cost $25.00 up to $600.00 each, depending upon the cemetery and location. The interment fee is the charge to open and close the grave, and sometimes includes a portion for perpetual care of the cemetery. This fee may cost $460.00 up to $1250.00 or more, depending upon the cemetery, location and the time of day or the time of year. The fee for interment of cremated remains may range from $150.00 to $500.00. Crematory charges at this time are $500.00, but can change without notice. There are also overtime and weekend charges that may apply, or for an expedited return of cremated remains in time for a service. The base charge is included with our fee for a direct cremation service. It is customary to offer an honorarium to the clergy or church that is conducting the funeral service. The amount offered is generally a personal, family decision; currently it is most common to offer around $200.00 or more, depending upon a family's wishes. The musicians generally receive an honorarium for their services as well. It is common to offer around $100.00 or more, depending upon a family's wishes. It is also customary to offer an honorarium to the church service group for the time of fellowship at the church. The funeral lunch is prepared and served as a courtesy by the church. It is common to offer the serving group $300.00 or more, depending upon a family's wishes. Flower costs vary among florists. Bouquets usually cost $75.00 or more per arrangement, a casket spray can cost $150.00 to $200.00 or more, depending upon their size, flowers selected or the time of year. The funeral director can write the notice with you and place it into whichever newspapers you wish. Some of the local weekly newspapers do not have a charge for this. Some weekly newspapers and most daily newspapers have a charge for publishing an obituary in their newspaper. For illustration purposes, the Fargo Forum and the Grand Forks Herald offer a complementary notice or a paid obituary that costs $20 per column inch, which also allows the obituary to be placed on their websites. The funeral director can assist you with the purchase of a grave marker. Depending upon the size, style and color of granite, they can range in price form $600.00 up to $5,000.00 or more for specialty designs. If a grave marker is already in place, we can assist by having the date of death of the deceased engraved on that marker. Depending upon the number of alphanumeric characters, this cost can range form $150.00 to $390.00. What about all these "extra costs" I hear about? Cross or Crucifix - There is no charge for these items if a traditional service is selected. We also offer an organized photo record of the flowers delivered to the funeral home, and boutonnieres for the casketbearers in order to signify the honor bestowed upon them. Clergy Vehicle - No charge for the funeral home vehicle which provides transportation for the clergy and leads the procession from the church or funeral home to the cemetery. Many funeral homes charge $125.00 or more for this service. Service or Utility Vehicle - No charge for the funeral home vehicle which may pick up items from your home, deliver flowers and equipment to the church or cemetery; and also distributes those items back to your home along with delivering flowers after the funeral at the family's direction. Many funeral homes charge $125.00 or more for this service. Casketbearer Vehicle - No charge for the funeral home vehicle which is used as transportation for the casketbearers, at the family's request, from the church or funeral home to the cemetery. Many funeral homes charge $125.00 or more for this service. Tent at cemetery - Included with vault purchase. Many funeral homes will charge this as a cash advance item, or as a setup charge of their own. This charge may range from $50.00 to $80.00 or more. Long distance phone calls or faxes - If long distance telephone services are necessary to complete the funeral arrangements by us or the family during the arrangement conference, there is no charge. Some funeral homes may even charge extra for placing an obituary for you. We do not charge these services to the family. Weekend or holiday services - We have no overtime charges. Some funeral homes charge overtime for visitations or funeral services scheduled on weekends or holidays. However, if an outer burial container is selected, the burial vault company does have an overtime charge for Sunday or holiday services. This will be treated as a cash advance item. Temporary grave marker - No charge. If there is no permanent cemetery grave marker which identifies the name of the deceased on their particular grave, we will provide one for the family until a permanent marker can be in place. Discounts - If the total funeral expenses are paid in full within 10 days of the service, you will receive a 4% discount on the funeral home merchandise that is selected, i.e. if the casket and outer burial container selected equals $2,500.00, the discount amount would be $100.00. 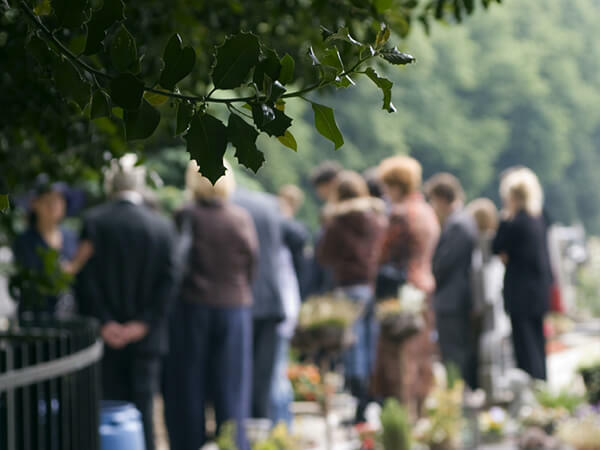 Guarantee for pre-paid funeral expenses - If a funeral service is pre-arranged and paid in advance, our services will never cost the family any more, regardless of how much our prices may rise in the future. To give you an answer to the question at the start of this guide, how much does a funeral cost? We have put together an average cost, based upon the most commonly selected services, casket, vault and cash advanced items for a traditional funeral service. These figures are from the year 2018 at our three facilities, Aaker Funeral Home of Lakota, Stanley-Iverson Funeral Home of McVille and Cooperstown Funeral Chapel of Cooperstown. To reiterate, these figures are merely averages, based upon the most commonly selected items listed above. The cost of a particular funeral would depend upon the services, merchandise and cash advance items requested. If you wish to have a consultation with a funeral director on our staff, we would be glad to illustrate for you the costs associated with your particular requests and selections. Except in certain special cases, embalming is not required by law. Emblaming may be necessary however, if you select certain funeral arrangements, such as a funeral with viewing. If you do not want embalming, you usually have the right to choose an arrangement that does not require you to pay for it, such as direct cremation or immediate burial. This charge includes removal of remains, basic services of staff, embalming, necessary authorizations, minimum shipping container and transportation to airport. This charge does not include shipping charges or visitation, rites, or ceremonies prior to forwarding the body. This charge includes transportation of remains from airport to funeral home, basic services of staff and transportation of remain to cemetery or crematory. This charge does not include visitation, rites or ceremonies. This charge includes local transportation, basic services of staff, care of remains, and a graveside service. This charge does not include any other visitation, rites or ceremonies, urn, urn vault or cash advance items. Our charge for a direct creamation includes removal of remains, transportaiton to crematory, necessary authorizations, crematory fee and basic services of staff. This charge does not include the use of facilities and staff for any visitation or ceremony, public or private, prior to the cremation. If you want to arrange a direct cremation, you can use an alternative container. Alternative containers encase the body and can be made of materials like fiberboard or composition materials (with or without outside covering). The containers we provide are fiberboard/cardboard boxes. Our charge for immediate burial includes removal of remains, transportation to cemetery, necessary authorizations and basic services of staff. This charge does not include the use of facilities and staff for any visitation or ceremony, public or private, prior to burial. Our charge for an anatomical donation includes removal of remains, transportation to the UND Medical School, necessary authorizations, basic services of staff and arterial embalming. This charage does not include the use of facilities and staff for any visitation or ceremony, public or private, prior to donation.